New technologies such as the Internet of Things (IoT), Artificial Intelligence, Big Data and Blockchain are transforming the world we live in. Everything is becoming intelligent: homes, businesses, schools, cities. In this new environment, no one wants to lose sight of how to improve the competitiveness of their business by investing in IoT technology. 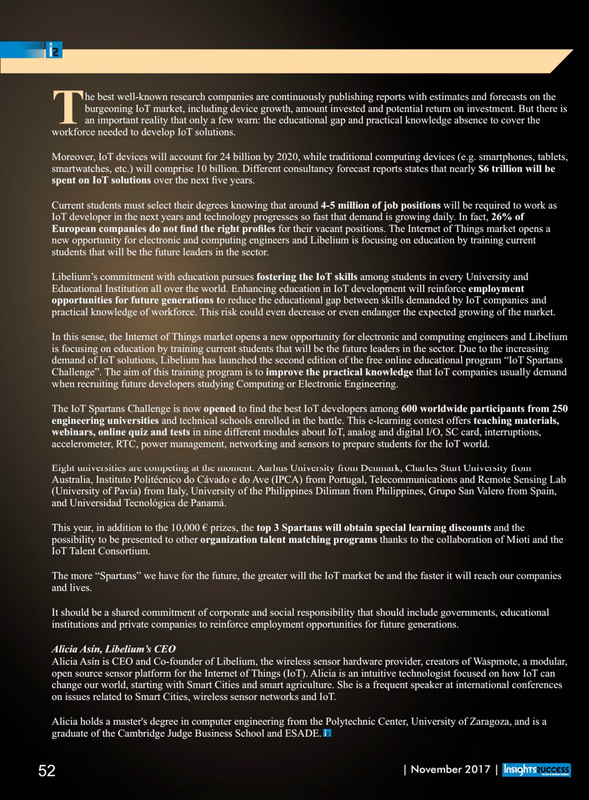 We want to present this decalogue of advice as the beginning of a project to identify the main challenges of the IoT to ensure its growth and success. Read more. In a study carried our by QYResearch, Libelium has been considered as one of the most important sensor manufacturer for the Smart Agriculture market: Global Agriculture Sensors Market Report, History and Forecast 2018-2025, Breakdown Data by Manufacturers, Key Regions, Types and Application. This study focuses on the production side and consumption side of Agriculture Sensors, presents the global Agriculture Sensors market size by manufacturers, regions, type and application, history breakdown data from 2013 to 2018, and forecast to 2025. Read more. The security of its IoT devices is the greatest commitment of Libelium. As IBM X-Force announced last week that there were some vulnerabilities in the Meshlium IoT Gateway, new actions were taken immediately by our R&D team offering a new software version released on August 1st. The Libelium sensor platform was initially created as an open source developing platform ready to be used by researchers and developers to have total control on the sensor nodes and the IoT Gateways. That is how six years ago the Libelium sensor platform became a worldwide IoT market solution. Several weeks ago Libelium was informed by IBM about some web vulnerabilities which had been found in the Meshlium Manager System. As Libelium considers security as a fundamental and essential core element for all its development projects new actions were taken immediately. Responding to Libelium’s commitment to the security of IoT devices, the company took action instantaneously and all vulnerabilities detected were automatically amended with a new software version released on August 1st which is ready to be downloaded from the Manager System. Read more. Libelium has been selected as one of the most important companies in the Internet of Things in utilities by Research and Markets. Utilities are facing significant challenges to their established business model, due to the increasing need to support distributed generation like wind and solar, storage, and electric vehicle charging, while keeping costs down. The “Internet of Things in Utilities – Thematic Research” focuses on understanding the impact of the internet of things (IoT) in the utilities sector. It discusses how the industry has been quick to adopt technologies like smart meters and smart grids, precursors to the wider adoption of holistic IoT solutions. Read more. In a fragmented market like the Internet of Things is, there is life beyond LPWAN communication protocols. Interoperability and multi-protocol will continue to be critical aspects, highlights eReports Asia in its latest report. The Global Wireless Monitoring (ZigBee Type) Market Report elaborates the complete details of latest industry trends and business circumstances to help the wireless monitoring market aspirants in making key business decisions. This report conducts a complete market review covering the main regions across the globe. Libelium is listed as one of the market players along with NHR, MASSA, Digi, Develco, Nyce and ZB-Connection. The report portrays the business profile of leading players along with their Wireless Monitoring (ZigBee Type) revenue, market growth, consumer base, and the business strategies followed by them. Read more. Research and Markets released the “North America Smart Parking Market Analysis By Hardware (Pucks, Cameras & LPRs, Smart Meters, Signage, Parking Gates), By Software, By Service, By Type, By Country, And Segment Forecasts, 2014 – 2025”. Libelium is mentioned as one of the key companies for the Smart Parking market in North America, which is expected to grow at a faster pace with a CAGR of 18.4%. The report includes a deep analysis of the market’s situation and future trends segmenting by hardware, software, type and country among others aspects. Read more. Last analysts reports place Libelium as one of the most influencer companies in the IoT market worldwide. Market Research Reports has recently released a global analysis for the IoT sensor market, its current situation, future trends and forecast from 2015 to 2023. While the market was worth $4.90 billion in 2014, experts foresee a remarkable 24.5% compound annual growth rate for the IoT sensors market, rising to a valuation of $34.75 bilion by the end of 2023. Read more. 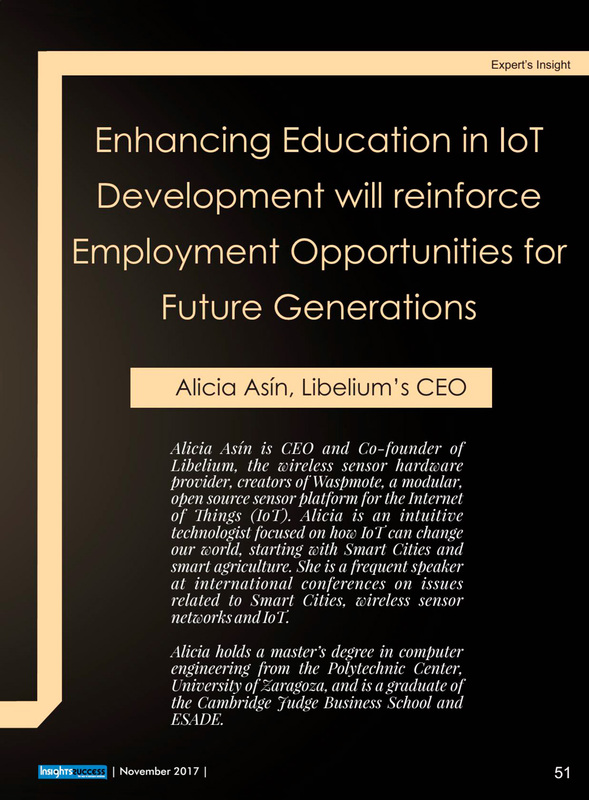 The importance of safety and the power of the ecosystem, drive the battle for the IoT’s interoperability in which Libelium plays a key role by offering both the integration of hardware devices and software services throughout the value chain.